It's not that often we get to see the birth of a new European outdoor manufacturer. And even less often one that specialises in innovative lightweight backpacking gear. After two years of buzzing in the lightweight community, the shop at Laufbursche.de is now online. Since the first time I layed my hands on Hendrik Morkel's borrowed prototype Laufbursche Huckepack I have hoped that it would reach the market. It was inventive, well manufactured and remarkably well designed. It even had a logo inspired by Blade Runner. And now, two years later, Laufbursche-gear.de is online. Apart from the standard edition of the backpacks Huckepack () and Huckepäckchen - you also have the possibility to specify your own custom made version in some of the coolest materials available. 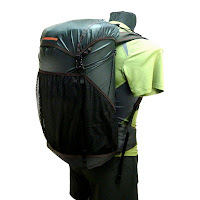 How about a backpack in black Cuben fiber? We look forward to the development of the other nice products that Laufbursche have in the pipe, for example the Lavvu pyramid shelter. Also in black Cuben, i presume. I will settle for the one I own.